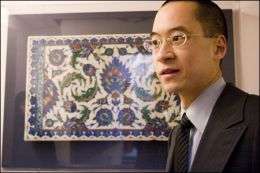 "Straightedges and compasses work fine for the recurring symmetries of the simplest patterns we see," Lu says, "but it probably required far more powerful tools to fully explain the elaborate tilings with decagonal symmetry." These girih tiles may have been used to generate a wide range of complex tiling patterns on major buildings from medieval Islam, including mosques in Isfahan, Iran, and Bursa, Turkey; madrasas in Baghdad; and shrines in Herat, Afghanistan, and Agra, India. In some cases, Lu found girih tiles used to create patterns of two distinct scales on medieval Islamic buildings. This approach generates infinite patterns with decagonal symmetry that never repeats -- also known as a quasicrystalline tiling, a phenomenon first described in the West in the 1970s by famed British mathematician Roger Penrose and more fully explained by Steinhardt and Dov Levine over the past 30 years.